Channel Island Lines (CIL), the successor to Huelin Renouf, ended its Southampton-Jersey-Guernsey Lo-Lo service from 19th November when the freight handled by the vessel was transferred to CIL’s trailer-based services using Ferryspeed. Chief Executive Andy Cook said, “It is with considerable regret that our present service model of a mixed Lo-Lo/Ro-Ro offer is no longer viable going forward. With little cost difference between the operations, we are obliged to offer the faster, next day service to all of our customers.” The 2,597gt/2012 built Huelin Dispatch is owned and managed by Dundalk Shipping. The ship had resumed the service on 27th September 2013 after original operator Huelin Renouf went out of business on 20th August 2013. At the end of November, the Huelin Dispatch commenced a new 3 year charter in Sweden. CIL has invested in a brand-new logistics warehouse at Chandlers Ford, near Southampton from which its UK Southcoast operations will be centred, with its Bristol operations continuing to service cargo from North UK to the Channel Islands and UK freight to both North and Southern Ireland. From 5th November FerrySpeed chartered the 1,512gt/1992 built Shetland Trader to operate a Portsmouth-Jersey/Guernsey service, thus bringing the Lo-Lo service full circle back to Portsmouth from where it relocated from to Southampton in January 2009. 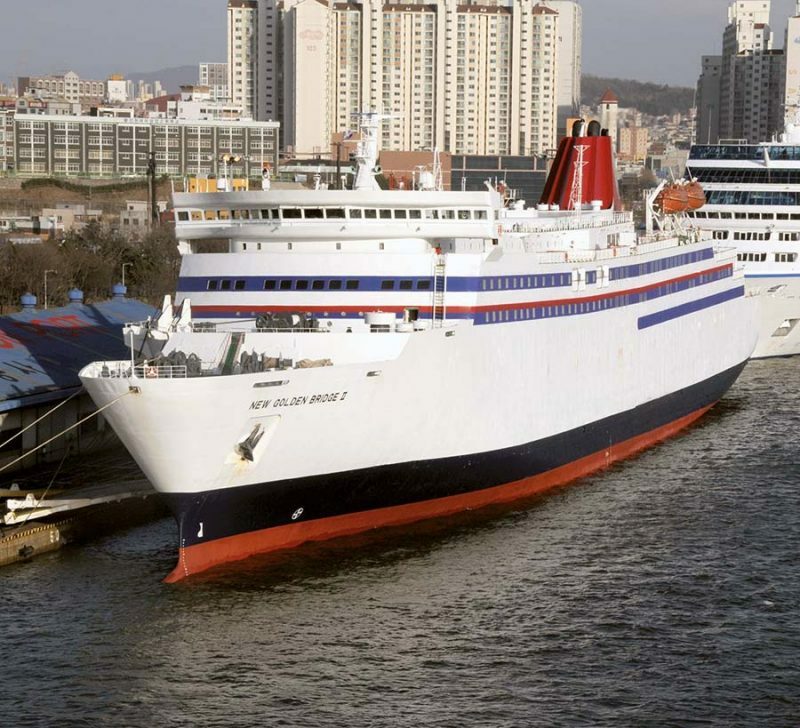 European Seaways looks set to receive into its fleet the 26,463gt/1990 built New Golden Bridge II (above), which has been purchased from Weidong Ferry Co. by the Arkoumani family. The 186.5m long ship departed from Incheon in early November bound for Greece as the Golden Bridge and is most likely to serve between Brindisi and Greece. Grandi Navi Veloci (GNV) has chartered out the 44,307gt/1997 built Rhapsody (former SNCM ferry Napoleon Bonaparte) to serve as a floating hotel all winter season in the Bahamas. The charter agreement is with Norwegian Cruise Line through which the 1996 built ferry will be deployed from mid-November to February as an accommodation vessel for NCL’s personnel relocated there whilst several ships from NCL’s fleet are dealt with in turn at the Grand Bahama shipyard. The Rhapsody will therefore play host to some of the crews plus staff in charge of the NCL fleet technical management. Hellenic Seaways’ 13,955gt/2007 built Nissos Chios transferred from her homeport of Piraeus to the Gibraltar Strait on 31st October to serve Africa Morocco Link’s Algeciras-Tangier Med route for two weeks. The 1,782-passenger/530 lanemetre capacity ship then moved onto a 3-month charter with Balearia on the Dénia-Ibiza-Palma service.